Democratic presidential nominee Barack Obama leads GOP rival John McCain 49 percent to 40 percent among registered voters in a new CBS News poll. The nine-point spread marks an increase of four percentage points in Obama's lead from a CBS News/New York Times survey taken last week. Obama also leads by nine points among likely voters, 50 percent to 41 percent. About 1 in 4 voters remains uncommitted to either candidate - they are either undecided or favor one candidate but say they could change their mind. While no single factor can account for Obama's increased lead, both the financial crisis and the first presidential debate may have benefited the Democratic presidential nominee. Neither candidate wins majority approval for their role in handling the financial crisis. 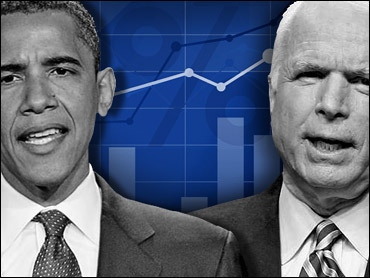 But forty-four percent of registered voters approve of Obama's handling of the financial crisis, nine points higher than McCain. Forty-six percent of those surveyed, meanwhile, disapprove of McCain's handling of the crisis, compared to 32 percent for Obama. Obama also continues to lead in voter confidence in handling the economy. Half of the registered voters surveyed say they are not at all or not too confident in McCain's ability to steer the economy, 11 percentage points more than say the same of Obama. Just 15 percent are "very confident" in McCain's ability when it comes to the economy, 11 points fewer than say the same of his rival. The Democratic nominee was also widely seen as having won the debate. Forty-one percent of registered voters, including more than half of those who watched it, said Obama came out on top; just 21 percent said McCain was the winner. Most voters said the debate did not change their opinion of the candidates, but Obama fared better amongst those who did. Twenty-eight percent of those surveyed said their opinion of Obama changed for the better, more than twice the percentage who said the same of McCain. While 17 percent said their opinion of McCain got worse, meanwhile, just 6 percent said as much of his rival. Obama's voters continue to be more enthusiastic than McCain's voters about their candidate, and their enthusiasm has increased in the last week. Sixty-one percent of Obama voters are enthusiastic about the Illinois senator, up eight points from last week, while 36 percent of McCain backers are enthusiastic about their candidate. Obama's favorable rating has risen five points from last week, to 48 percent, while his unfavorable rating is 32 percent. McCain's favorable rating is 39 percent and his unfavorable rating is 42 percent, an increase of 7 points from last week. McCain's support appears softer than Obama's. Twenty-one percent of McCain voters say it is too soon to say for sure who they will vote for, compared to 14 percent of Obama voters. Opinions of Republican vice presidential nominee Sarah Palin are now evenly divided, with her unfavorable rating (33 percent) now slightly higher than her favorable rating (32 percent). Last week, Palin had an eight point net positive rating. Democratic vice presidential nominee Joe Biden's favorable rating stands at 34 percent and his unfavorable rating at 19 percent. Women's perception of Palin has become increasingly negative. On Sept. 8th, Palin had a 47 percent favorable rating among women and a 19 percent unfavorable; now her favorable rating among the group is down to 30 percent, while her unfavorable has risen to 34 percent. The debate has not changed voters' perceptions of the candidates' qualities. McCain continues to have a slight edge on how registered voters expect the candidates to handle Iraq and is far more likely to be seen as an effective potential Commander-In-Chief. In addition to the economy, Obama has a clear advantage on empathy, with 67 percent saying Obama understands their needs and problems compared to 46 percent for McCain. More than half now say Obama is prepared to be president, up from 46 percent last week, while a larger percentage, 60 percent, say McCain is prepared for the job. While nearly 3 in 4 registered voters say Obama cares more about protecting ordinary people, more than 1 in 2 say McCain cares more about protecting large corporations. Obama is leading among women, moderates and voters under age 45. He now has the support of nearly two in three voters who supported Hillary Clinton for the Democratic nomination, a slight increase from last week. McCain continues to lead among white voters, including white men. White Catholics and white evangelicals also support McCain, as do conservatives. Obama has a five point lead among Independents in this poll. Last week, this group narrowly backed McCain. This poll was conducted among a random sample of 1,257 adults nationwide, including 1,113 registered voters, interviewed by telephone September 27-30, 2008. Phone numbers were dialed from RDD samples of both standard land-lines and cell phones. The error due to sampling for results based on the entire sample could be plus or minus three percentage points, and plus or minus three points for the sample of registered voters. The error for subgroups is higher.